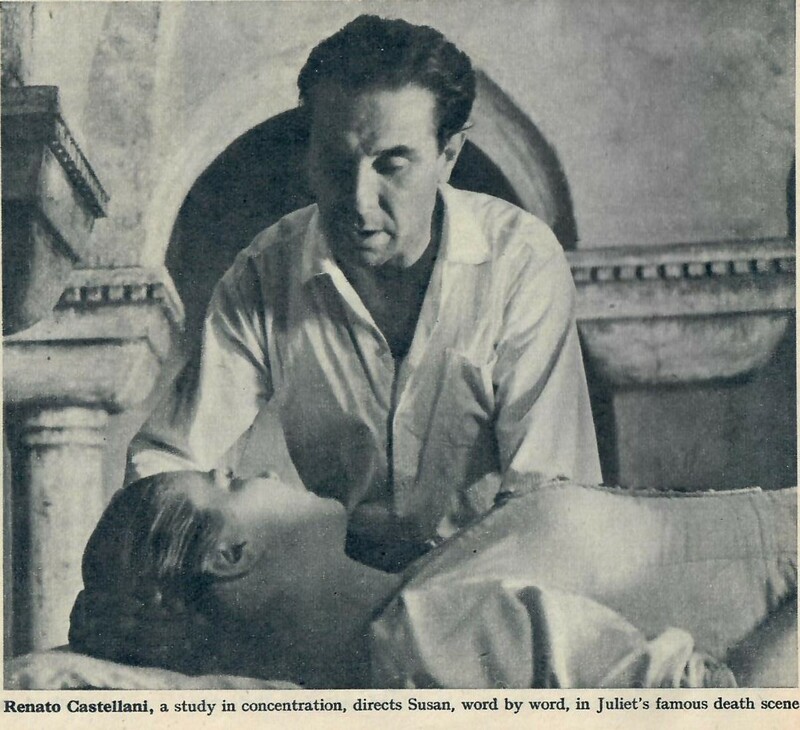 Susan Shentall made only the one film ‘Romeo and Juliet’ in 1954 after being ‘spotted’ dining in London and cast as Juliet in a film made in Italy mainly during the summer of 1953. We walked into the cinema, took our seats and the lights went down. The two hours that followed are the only proff I have that last year was not the dream that it seems to be now. As I watched the story of star-crossed lovers unfolding on the screen,. I let my mind drift back to9 that Italian summer. The heat, the noise, the colours, the tears, the laughter, the weariness, in endless procession through Rome, Venice, Verona, Siena …. It seemd incredible that something had been created from all that confusion. But to go back to the beginning …..
One Friday night last year ( 1953) my parents and I were dining at the Caprice, a restaurant we often went to in London. During the meal, Mario, the proprietor, came over to talk to us. Suddentl he said: ‘How would you like to play Juliet?’. I was completely taken aback. Mario explained: An Italian Film Director, Renato Castellani, was looking for someone to play Juliet in his film ‘Romeo and Juliet’. Apparently he often came to the Caprice and had asked Mario to keep a look-out for any potential Juliets. Now, Mario thought. I might be the type Castellani was searching for. Could he give him my telephone number ? Highly amused. we agreed, and went back to our hotel not expecting to hear no more. However, next morning, I found a message waiting for me. Would I phone Mr. Janni ? I think I was more intrigued than anything else. Who were all these people ? Where would it all lead ? The sequel to that telephone call was the most embarrassing half-hour of my life. Mr. Janni had arranged to meet my father and myself that evening at our hotel. He sadid that he would bring Signor Ghenzi, the Italian Producer with him. They arrived, and for a full ten minutes not a word was spoken. They just sat and looked at me as though I was something in the Zoo. Then, suddenly, the three men went into a long and rapid discussion in Italian. Eventually they asked if I would do two tests. I was amazed that they even considered me for the part. I had thought they would take one look at me and try to leave as tactfully as possible. I suppose I was flattered so I agreed. I remember little of my first test, at the house of Bob Krasker, the cameraman. I seemed to be surrounded by at least thirty people, all staring; someone doing things with my hair, someone else daubing my face. Later, I came to know and love these people – the hair-dresser, the make-up man and the others – but then they were just part of the general confusion. I was put in the center of an arc of impossibly bright lights, unable to see beyond them, but knowing that all those people were still there. I did as they requested; I lokked this way and that, smiled, repeated some lines. Somehow I got through. Then followed a week’s intensive rehearsing with Castellani. WE had decided to do the balcony scene, so I wherefore-art-thou-Romeoed through the week and set out for Pinewood Film Studios for a full test. This time the lights did not bother me. 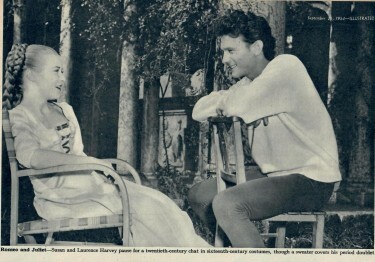 At Pinewood I met Laurence Harvey, who was to play Romeo. I remember feeling very sorry for him, having to waste his time in this way. But he was very kind to me, and we swore undying love for each other for the best part of a day. People said afterwards how amazed they were at my calmness, but I was fascinated by all that was going on around me, and as I had not the slightest expectation of getting the part anyway, I didn’t see that there was anything to worry about. When it was all over Larry said: ‘very pleased to have met you, Miss Shentall,’ and steamed off in his white sports car. I went home to Derbyshire. About a fortnight later, when I thought that by this time they would be at least half-way through the film, Castellani phoned to say that I had the part. Everybody took it calmly. My Mother went around looking as though she had lost a near relative. I don’t quite know what she thought was going to happen to me. The others, far from being vastly impressed and thinking they had a second Helen Terry in their midst, treated the whole thing as an enormous joke. I felt it would be a wonderful experience. I had nothing to lose. The fact that I would spend six months in Italy really clinched the matter; my parents had said that I must make my own decision. Of course, in a way the whole thing was preposterous. Unlike many of my friends in our schooldays, I had never imagined myself reclining on a leopard-skin in the heart of Hollywood; nor had I any ambition to see my name in lights. At the very mention of any play or entertainment being organised, I would make myself as scarce as possible in the hope of being exempted from even the smallest part. I was once induced to play and Angel in a Nativity play, and it took me many weeks to recover from the ordeal. I passed the two months in a complete daze. There was the whirl of preparation – make-up tests, a three day visit to Florence for costume fittings, and final packing and farewells. 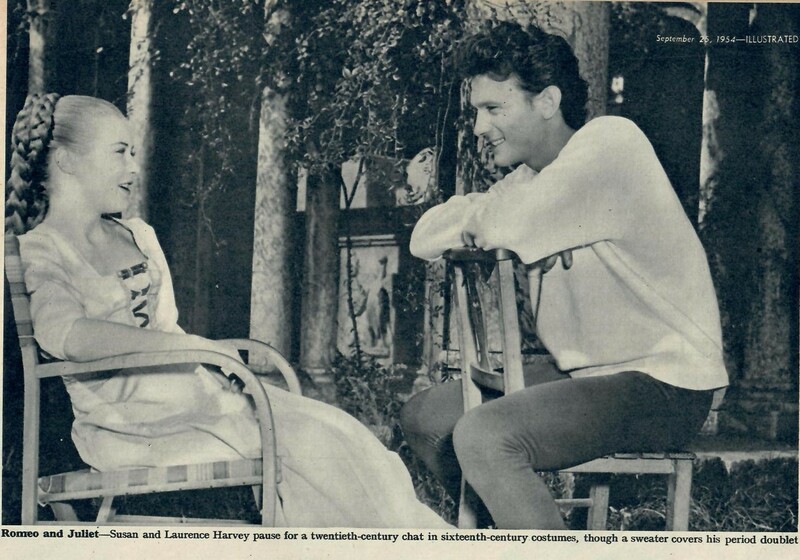 Then the first day’s shooting with Flora Robson, cast as the nurse, and Lydia Sherwood, who played Lady Capulet. The thing I found most difficult at first was trying to forget all the people on the set, and the great unwinking eye of the camera, and to concentrate on what I was supposed to be doing. I would return to my hotel at night with abrely enough strength to have a meal, and the alarm clock would rouse me again all too soon. I remember walking on to the set one day, as though suddenly emerging from a great fog. I found that these people, who had worried me so much to start with, I now knew individually. I discovered that I was thoroughly enjoying myself. People often ask me if I found it difficult to play the role of Juliet. I must admit I never thought of it in that sense. I merely tried my best to do what Castellani asked of me. He is a wonderful person – small volcanic, with a typical Latin temperament, one minute crying and tearing his hair, the next laughing like a schoolboy at some joke. We were all under his spell. He never lost patience with me, though he must have often felt like doing so. Before shooting a scene, he would spend hours explaining the significance of it to me. He would say: ‘It is what you feel that metters. Never think too much about what about what you are doing. If you have it here – pointing to his heart – it will be alright. You will see’. He was tireless and a perfectionist. He would rehearse until every detail was perfect, so that when we came to shoot I could forget the technicalities and concentrate on my heart ! This must have been extremely frustrating for all the others taking part, but they were wonderful to me, especially Flora Robson. I shall ever be grateful for Flora’s kindness and sympathy, and the advice she gave me. She was always ready with a word of encouragement. I remember I found it extremely difficult to cry – really cry. Castellani did not approve of using glycerine or fake tears, and he was quite sure I must have plenty to cry about anyway ! Then Flora explained to me the ‘technicalities of crying’ and told me the story of the origin of the beautiful song ‘Loch Lomond’, which has always brought tears to my eyes. So, after that, I was able to weep on request. I had been told about Venice, but when the time came to go there from Rome, I was hardly prepared for that magical city. It completely took my breath away. I found it absolutely fascinating to travel everywhere by gondola or walk the narrow streets. We started shooting in the Ca d’oro, a famous old museum on the Grand Canal. The weather was appalling, and in one particular bad storm the canal water came up several feet and came flooding on to the set. All the lights went out and to add to the confusion, a crate of pigeons was knocked over and the pigeons escaped. The uproar was unbelievable. The Italian Unit blamed the English Unit and vice versa. At last, when things looked like getting out of hand, Castellani decided to call it a day. As we were all working so hard, no-one felt like much more than a meal and bed at the end of a day’s shooting. That is why the party given for my Birthday was such a wonderful surprise. Norman Wooland suggested that I should stroll along to the set with him, as he ‘wished to see someone’. Unsuspecting, I went – to find the entire unit in the courtyard of the Cap d’Ora. On a table was the most enormous cake I’ve ever seen with Birthdau Greetings in Italian and bottles of local wine called Guilietta. It was a wonderful party. Larry and I cut the cake with the dagger ( the one with which later we were both to meet our ‘deaths’ ) and handed pieces round to everyone. I was so deeply moved I nearly cried. This was my reward for all the despair, the tears, the long hours, the exhaustion. To know that all these people were my friends, that they acres enough to arran ge this, made it all seem worth while. I realised what people had told me; that the film business gets into your blood – and heart. From Venice we moved to Verona, the home, according to legend, of Romeo and Juliet. It was here that I first saw some of the rushes of the film. I remember being terrified at the thought of seeing myself on the screen. However, when I did, I found it quite impossible to associate myself with the girl I saw; she seemed so remote and utterly unlike myself.. After that, I lost all fear of seeing the film. I found it as impersonal as watching someone else. We all found working in the heat very trying. The temperature was around 112 degrees, on top of which we had the lights and heavy costumes. Castellani would produce two hot-water bottles which he filled with ice, and at every available opportunity would lay on our foreheads. I think this really only increased our discomfort, but we could hardly tell him so. Gradually, the shooting of the film was completed. One be one, people finished their parts and went home. At last it was my turn. There was the last day’s work in a little mountain village near Siena; then the farewells, the mad dash to catch the train to Rome, and the arrival at London Airport one cold October day. It seemed unbelievable that the whole wonderful experience had not been a dream. But I have my proof that it was not, and I know I shall always have happy memories of that Italian Summer. The future ? I am always being asked if I will make more films. The answer is ‘No’. Without a dierector of Castellani’s calibre, I don’t think I would be capable of doing so. My ambitions now centred solely on my marriage and new home. Now, after the London premiere of Romeo and Juliet – when, for the last time, I shall see all those well-known faces – my wonderful year will be all over. But what a story to tell my Grandchildren. I have to say that writing this article as above, has proved one of the most interesting tasks I had had doing this Blog. 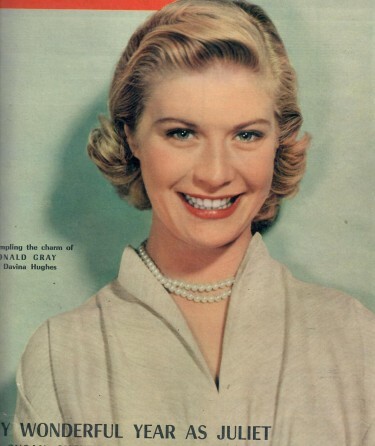 From finding a scene from this film in one of my old Film Annuals with a picture of Susan Shentall – who I had never heard of up to that point – to then finding out her astonishing story and then delving further into any information I could glean – to finishing with this article actually In Her Own Words. 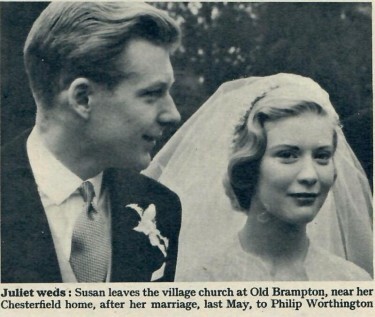 She is sadly no longer with us so the question I would have liked to ask her can never be answered – I wonder if, for a brief moment, she maybe regretted leaving this film career behind after such success AND the ‘the wonderful year’ she had or maybe she was quite happy with her one year in film land. I hope she had a happy life though. Extremely interesting article, Neil. What a fascinating insight into those heady days of 1950’s film making.